Step 2: Click on the donation you wish to edit. 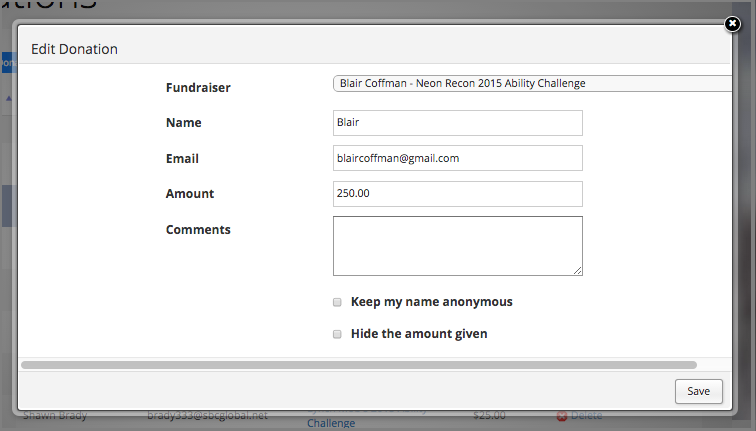 You will notice it will highlight Then click the Edit Donation button. Name: Edit the name of the donor. Amount: Edit the donation amount. This will not change what amount they were charged. This will simply change the amount as it will show on the fundraising page and amount that will be reflected in the total. Comments: Edit the comment that was given. Click Save and you should then see these changes reflected on the donation page(s).